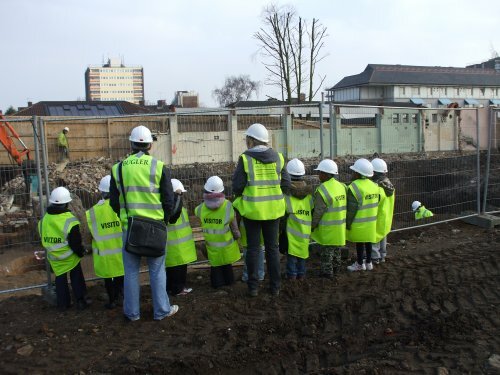 Lorna showing a party of primary school children around a site in West Ham. A full A-Z glossary is provided that supports and explains some of the more complex terminology used throughout the entries on the website and can be cross referenced, with descriptions, illustrations and further links to external sites that provide more in depth information if required. An explanatory time line is provided to support the information provided in the rest of the website. Some activities and worksheets, including worksheets produced by UCL Public Archaeology M.A students. This area provides links to useful web sites for teachers and students interested in archaeology. This area provides links for more detailed information for adults interested in archaeology, and understanding the methods and techniques in greater depth.